The idea of establishing an international financial institution for Muslim counties was discussed in the late 1960s by the Organization of Islamic Conference (QIC) Working papers were circulated and proposals made, but no concerted action was taken until the first meeting of the Finance Ministers of the Islamic countries held in Jeddaha 1393H (December, 1973). The second conference of finance ministers held in August 1974 adopted the Articles of Agreements establishing the Bank. The Bank began functioning on 15 Shawal 1395H (20th October 1975). The establishment of the Islamic Development Bank was aimed at contributing to economic development and social progress of its member countries by reinforcing economic co-operation among them, assisting in the development of Islamic economics, banking and finance, and promoting the economic and social welfare of Muslim communities in non-member countries. In order to realize the abòve objectives, the IDB is empowered by its Articles of Agreement to engage in the following activìties. 1. Participation in equity capital of productive projects and enterprises in member countries. 2. Investment in economic and social infrastructure projects in member countries by way of participation or other financial arrangement. 3. Extending loans to the private and public sector for the financing of productive projects, enterprises, and programs member countries. 4. Establish and operate special funds for specific purposes including a Fund for assistance to Muslim communities in non-member countries. 7. Assist in the promotion of foreign trade especially in capital goods, among member countries. .
2. Accounting And Auditing Organizations for Islamic Financial Institttions (AAOIFI). Institutions. AAOIFI was registered on 27 March 1991 in the state of Bahrain as an international autonomous non profit making a corporate body. ii. Disseminâte the accounting and auditing thought relating to the activities of Islamic Financial Institutions and its applications through training, seminars, publication of periodical newsletters, preparation of research and other means. iii. Prepare, promulgate and interpret accounting and auditing standards for Islamic Financial Institutions in order to harmonize the accounting practices adopted by these institutions in the preparation of their financial statements, as well as to hatmonize the auditing procedures adopted in auditing the financial statements prepared by Islamic Financial Institutions. iv. Review and amend the accounting the auditing standards for Islamic Financial Institutions to cope with developments in the accounting and the auditing thought and practices. 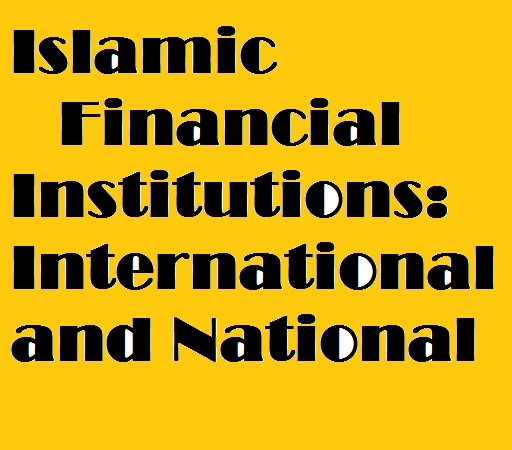 Islamic Financial Institutions that are published by AAOIFI. vi. a General Secretariat to be headed by a Secretary- General. Islamic Research and Training Institute (IRTI) was established in 1981 to undertake research, training and knowledge generating activities on economic, financial and banking issues. It organizes seminars and conferences on various subjects in collaboration with national, regional and international institutions. It also undertakes information gathering activities such as the development of the Information system for use in the field of Islamic economics, banking, and finance, as well as management of databases on Muslim” experts and trade information and promotion. papers, background and discussion papers, seminar proceedings, lectures, and articles published in the IRTI journal “Islamic Economic Studies” which is a refereed bi-annual journal published in Arabic, English, and French. 4. International Association of Islamic Banks (IAIB) . well as in the meetings of specialized bodies of the OIC in the field of banking and insurance. However,’ the specific objectives of IAIB are given below. a. Provisions of technical assistance and sharing of experience with those Islamic communities that wish to establish Islamic banks at request. b. Follow up of procedures for establishing Islamic banks at the local and international levels and support of their activities and assistance in their development. c. Laying down foundations for cooperation, coordination and sharing of experience among Islamic banks as well as exchange of information and data relating to positions and obligations of customers on the strictly confidential basis provided that such information shall be confined to member banks and not be circulated to non- members. The Association shall also assist member banks to overcome obstacles and sort out problems facing Islamic banks, without interfering in their executive affairs. d. Representing common interests of Islamic banks at all levels and defending interests of member banks. e. Endeavoring to facilitate flow of funds among Islamic banks. f. Seeking to coordinate and standardize banking systems and procedures relating to Islamic banks’ activities. g. Enhancement and development of performance of Islamic banks’ staff members. h. Provision of advice and undertaking studies of projects relating to Islamic banks together with offering proposals for attracting funds and identifying the role of Islamic banks in that respect. j. Undertaking researches on issuance in banking, money and credit at the local and international levels proposing viable resolutions of the same, in order to enable Islamic banks face those problems. k. Staging campaigns with the objective of enhancing awareness and propagating Islamic systems and transactions. Islamic financial services industry, to establish a database of Islamic banks, financial institutions and industry experts and any other objectives which the General Assembly of the IFSB may agree from time to time. challenges and promotion of co-operation among members and other parties, particularly regulatory authorities. Established in 2001 in Manama, Bahrain to develop and regulate an International Financial market bašed on Shari’ah Rules and Principles. Established in Dubai UAE in the year 2005 to settle financial and commercial disputes between financial Institutions that have chosen to comply with the Shari’ah to settle disputes. I. Islamic Banks Consultative Forum (IBCF). Islamic Banks Consultative Forum (IBCF) has been established on 1st October, 1995 in Bangladesh with the objective of welfare and well being of Islamic Banks and Banks having Islamic Branches in the Country. iii. To pursue the common interests of Islamic Banks with Bangladesh Bank, Government, Semi-Government and Non-Government agencies at home and abroad based on laws of the land; . vii. To help in the development of new Financial products, Treasury Bonds, Instruments, Mudaraba Bonds & Certificates by the Government Authorities within the preview of the Islamic Shari’ah. viii. To have cordial and mutual intellectual academic, research and development activities and relations in Islamic Development Bank (IDB), International Associations of Islamic Banks(IAIB), The Accounting and Auditing Organization of Islamic Financial Institutions (AAOIFI), Islamic Research and Training Institute(IRTI) of IDB and like other Organization. Bangladesh Islam Bankers Association abbreviated as VBIBA! was founded in 1981 as a voluntary organization. It was formed by the wholehearted efforts of some Bankers & Economists with the basic objective of establishing Islamic Financial System Bangladesh. (A) To remove Interest from every sectors of life specially from banking Sector. (B) To establish an Islamic Banking system in Bangladesh. To form an integrated cadre of Bankers, Researchers, Trainers, Educationists, Intellectuals & Investors for achieving the ultimate goal. To achieve such goals BIBA is directing various functions through Training, Research, Advices, Publications, estblishing institutive & by creating a favorable environment. Within a short span of time, BIBA has been capable to contribute to organizing the public opinion about Islamic Banking in Bangladesh. In the meantime, BIBA has arranged training on Islamic Banking for different professionals including about 200 senior bankers. IBA has also edited a rare book namely “Readings in Islamic Banking” the first of its kind in Bangladesh. BIBA has also taken an effort to publish a monthly representing journals as “News Letter’ aiming to supply necessary information and to organize public opinion about Islamic Banking. BIBA organized a number of seminars, symposium also in collaboration with other organization. Finally, BIBA was successful enough to materialize its dream to establish an Islamic Bank in the country in the year 1983 where BIBA supplied the trained & motivated manpower initially without which it was difficult to function the new born Islamic Bank smoothly. So the contribution of Bangladesh Islamic Bankers Association in establishing Islamic Bank in the country is unparallel. Islamic Economic Research Bureau (IERB) is a privately organized research organization with the basic objective of undertaking research on Islamic Economics and disseminating the results of such research works through various means. The IERB was founded in 1976, by a small group of dedicated Islamic thinkers and was registered in 1982. To undertake research on Economics of Islam with special reference to modern and publish books on Islamic Economics and Finance. To develop a group of thinkers on Islamic Economic. world working for the achievement of similar objectives. To organize training program on Islamic banking and insurance. Holding of International Seminar on-Islamic Banking (1980), Islamic Approach to Development with Special Reference to Bangladesh (1985), Islamic Common Market (1993), Zakat and Poverty Alleviation in Bangladesh (1998), Financial Management in Islamic Perspective (2004), Islamic Alternative to Poverty Alleviation : Zakat, Awqaf and Microfinance (2007). In addition, a number of national seminar on issues like Islamic Economics, Distribution on of Income and Wealth in Islam, 4th five-year Plan of Bangladesh, Gulf Crisis : Impact on Bangladesh Economy, Bangladesh : Future Directions and National Budget. The IERB has so far organized 350 monthly, bi-monthly, district level and regional seminars. Zakat and Poverty Alleviation, Women in Development, Development of SMEs :Financing from Islamic Perspective. A number of Research and Policy Monograph has also been published both in English and Bangla. The IERB has been publishing its quarterly journal entitled Thoughts on Economics since 1980. It is a refereed journal widely acclaimed home and abroad, It has also been listed with the Library of Congress bearing a number ISSN 0256-8586.